Pedaling along the Coeur d’Alene River. The Bitterroot 300 is a bike route that links the Trail of the Coeur d’Alenes to the Route of the Hiawatha to a series of unnamed old rail corridors or gravel roads, making a 300km partial loop. 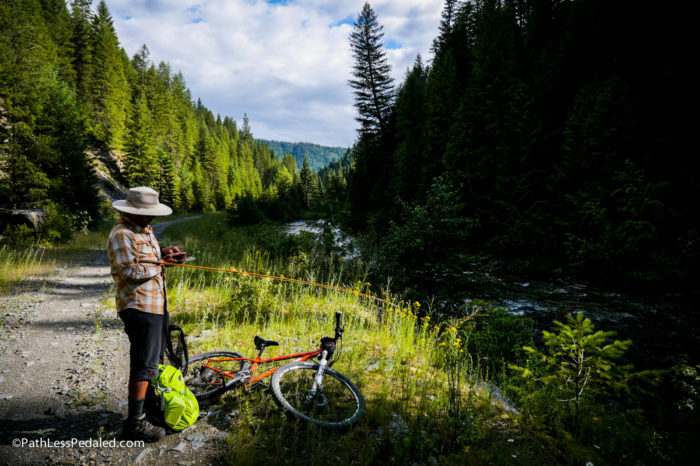 The route follows the Coeur d’Alene and St Joe Rivers, cuts through forest and marshland, crosses innumerable trestle bridges, and brings you face-to-face with a variety of wildlife. 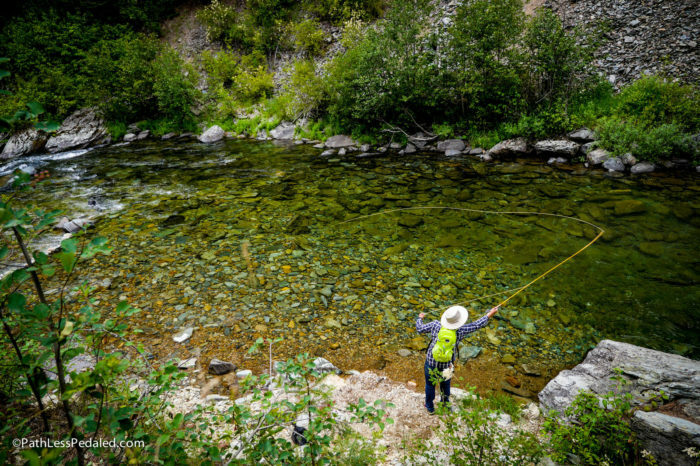 Even if we weren’t able to cycle the whole Bitterroot 300 on this trip, we knew we wanted to trace the route (and its promise of adventure) as much as possible – especially if the access to car-free fly-fishing water was as good as it looked on the map. We find ourselves in the historic mining town of Wallace on a surprisingly gray early summer day, but the weather hasn’t stopped the steady stream of bikes on the trail and in town. We check in to the Wallace Inn, where almost every car in the parking lot has a bike rack, and we wander down to the City Limits Pub, one of two breweries in town. City Limits, as the name suggests, is just on the edge of town. 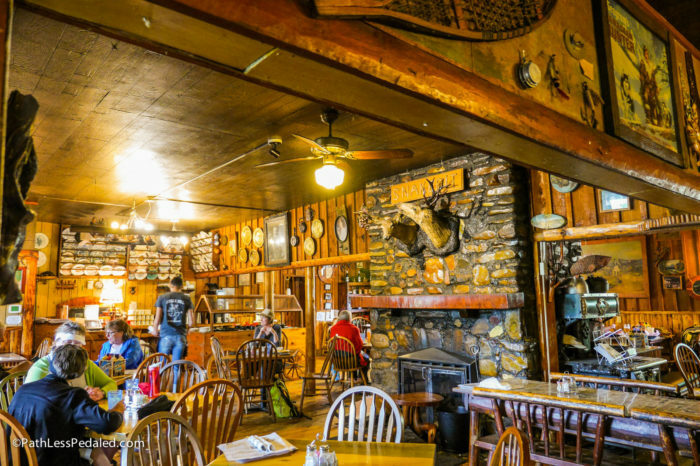 It sits atop a small creek and has a working freight elevator in the middle of the restaurant (a remnant from the building’s mining past). Tired of eating sandwiches, we topped up with small town diner food at its finest: chicken fried steak and broasted chicken. An inside look at the iconic Snake Pit. The next day, we head to Enaville to fish the North Fork of the Coeur d’Alene River, but not before a quick lunch at the Snake Pit, Idaho’s oldest restaurant. In its heyday, it catered to a steady stream of rowdy miners hoping to strike it rich. Now, it’s a family-friendly establishment serving delicious brisket tacos, the artifacts on the walls quietly holding onto its colorful past. Next door is The River Flyshop, owned and operated by Dustin Stetson, who recently opened the shop after moving home from Montana. He guides the local rivers, offers casting classes, and sells flies and beer. When he’s not working, he and his girlfriend ride their skateboards down the Trail of the Coeur d’Alenes to fish their favorite spots. This is our kind of shop. He shows us a map of the North Fork that he helped research. It is chock-full of detail and we happily buy one to help us navigate the river. The North Fork of the Coeur d’Alene River is a beautiful piece of water. 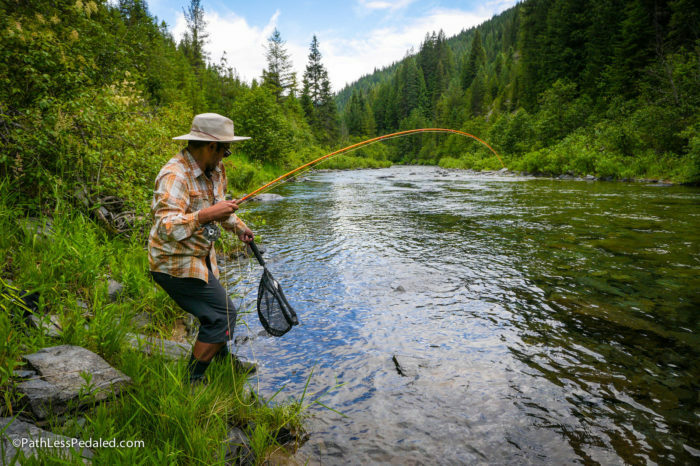 Lined with trees, it is wide but not too deep, making it great for wading and bank fishing. We follow Old River Road as it winds along the West side of the river. The road is paved for the first two-thirds, then turns to gravel, which keeps it lightly-trafficked and excellent for biking. We stop at a few gravel pullouts and cast out our lines in several spots. The trout are picky and not easily fooled. It takes good drifts and multiple fly changes to finally entice a bite. We get into a few beautiful rainbows, including one big fighter who breaks off Russ’ line at the last second for a long distance release. Plenty of time to stop and fish on this trail. From Wallace, we follow Moon Pass Road, a steep narrow gravel route across the mountains. The road is not for the feint of heart but offers incredible views. After 20 miles, we intersect the Southern end of the Route of the Hiawatha (the “official” Bitterroot 300 route), where we continue onto the old rail corridor. We are thrilled to discover that, yes, the road really does take you (and your car) through the old rail tunnels and across the old trestle bridges! Information on this part of the Panhandle is hard to find, but we’ve been told that there’s a stellar forest service campground on the North Fork of the St. Joe River. The directions are confusing until we’re there, and then the campground is exactly where we’re told it would be. Turn off the main gravel road just after crossing the big trestle, wind around under the bridge, and you run right into the Telichpah Campground (previously known as either the North Fork or Squaw Campground). We claim a forested site right next to the river, and discover we’re the only ones there. North Fork of the St. Joe offers great technical small water fishing. In the morning, we load up the bikes to ride into Avery along one of many mysterious stretches of the Bitterroot 300. The road into the campground dead-ends into a gate and then turns into a car-free double-track trail that follows the river into town (shared with ATVs). We pedal the 5 miles into town, stopping constantly to take in the stunning scenery and watch for fish rising in the river. Our tire tracks mingle with the deer and other critter tracks, and we talk loudly to each other in case any bears are hanging out nearby. In Avery, we’re excited to find much more than a simple Google search would lead you to assume. We chat with a few folks, explore the Milwaukee Road history museum and discover a well-stocked fly shop owned by a fellow cyclist. The Idaho Fly Fishing Company offers a pancake breakfast and ice cream; and if you ride your bike from the shop to the state line and back (on their un-official Bitterroot Fondo route), your photo can live in perpetuity on the shop wall. Enjoying the waters of the St. Joe near the Telichpah Campground. We spend the afternoon fishing along the main stretch of the St. Joe River, then head back along the trail to the campground. The ATV traffic has picked up in the area, but we still don’t see anyone on the trail. At the Southern end of the campground, there’s a series of nice deep pools in the river, so we wader up and cast out our lines. 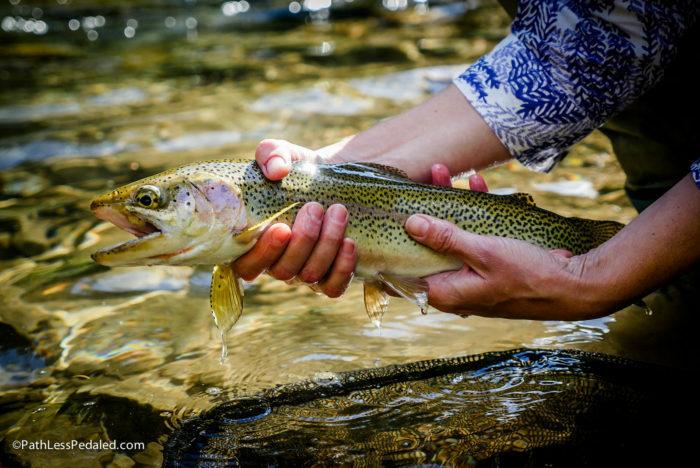 We reel in several small rainbows, and Laura hooks the trophy of the day, 13” cutthroat that’s way bigger than what you would expect to find in the river. No words needed for this gorgeous Cutthroat Trout. As Laura released the magnificent fish, it dawned on us that this was the theme of our Panhandle adventure: So much more than we expected. This part of Idaho rewards the adventurous and those who are willing to get off the beaten path. We loved every minute of the rugged beauty, but felt like we barely scratched the surface of all the cycling and fishing opportunities. And we never did see a moose, so we know we’ll be back. If you are traveling to Wallace and didn’t bring a bike, don’t fear! The Wallace Fly shop offers “on the fly” bike rentals. If you plan to fish in the area, be sure to read about how to Play Clean in the Coeur d’Alenes River Basin. If you’re thinking about driving or riding up Moon Pass, be prepared. It is steep, unpaved, and best traversed in a vehicle with good ground clearance. If you plan to ride it on a bicycle, a mountain bike is your best option. 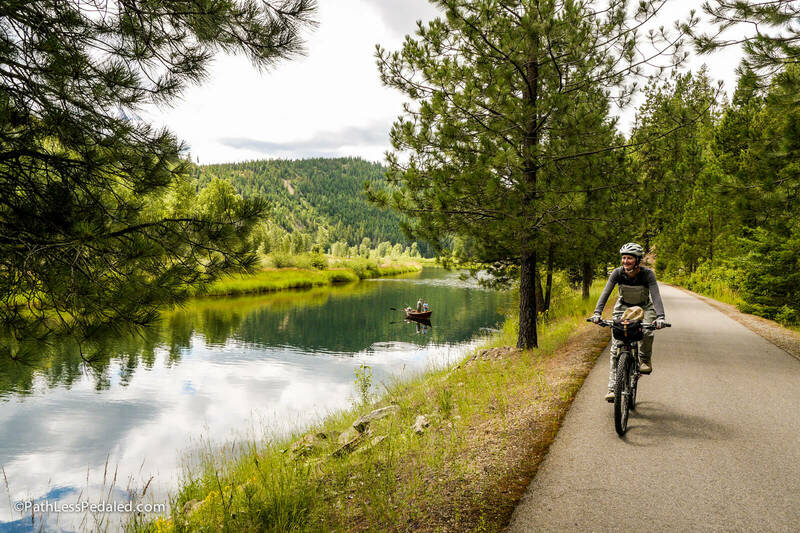 For itineraries on how to ride the Bitterroot 300 as a bike-camping trip or with motel stays, visit the Friends of the Coeur d’Alene Trail website. All images, including feature image, are credited to The Path Less Pedaled. For three years, Russ Roca and Laura Crawford traveled the US by bicycle. Now, based out of Portland, Oregon, they travel in search of great cycling and fly-fishing destinations, sharing their passion for multi-sport adventures through words, photos, and video. Find them online at: www.pathlesspedaled.com, and on Facebook/Instagram: @pathlesspedaled.